You will maybe recall our recent visit to The Mariners Trust of Grimsby Town FC. This was a really interesting meeting, although it was apparent was how few parallels could be drawn between their organisation and HUST. We were impressed with how the Grimsby Trust demonstrates how a club’s management and supporters can work closely together for the mutual benefit of the club, however, this is not a hugely common feature across the Supporters Trust network. 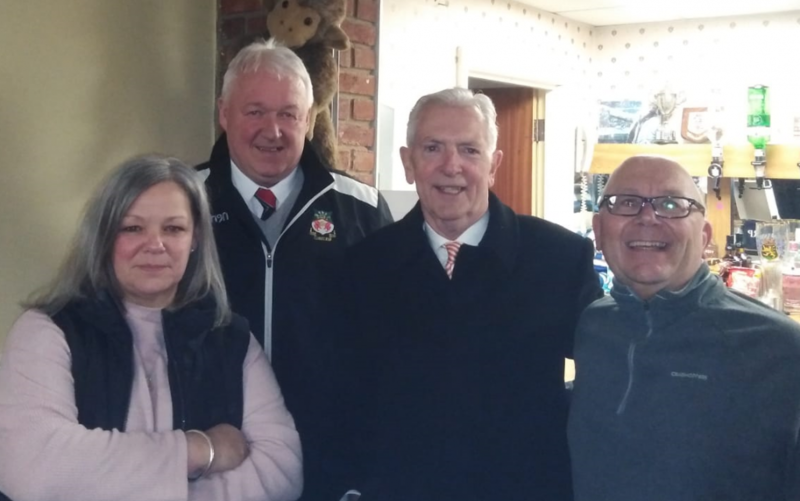 Recently Wrexham AFC paid a visit to the Super 6 Stadium, and HUST recognised that this was a great opportunity to meet up with them, to bend their ears and to learn more about the history of Wrexham Supporters Trust (WST). During the visit WST Chairman Peter Jones spoke with BBC Tees sports presenter Rob Law. L-R: HUST secretary Jo Grylls, Wrexham Supporters Trust Chairman Peter Jones, HUST Honorary President Eddie Kyle, HUST vice-chair John Cooke. Wrexham Supporters Trust Chairman Peter Jones speaks with BBC Tees sports reporter Rob Law on behalf of HUST. WST was formed in 2002 and ran a ‘Beer a Week’ campaign to raise funds for player purchases. In 2004 Wrexham AFC became the first club to be docked 10 points for entering administration. This ultimately relegated them from League One. When in 2005 the club’s owners tried to sell the clubs home, the famous Racecourse Ground it resulted in a legal battle between the then owner and WST. Birmingham High Court found in the fans favour, a decision upheld at the Appeal Court in 2006. The club was eventually taken over by two local businessmen, but when promises of a share issue and a fan director were not delivered, WST decided to hold back all funds until suitable engagement was achieved. WST worked incredibly hard at fundraising for their Trust and by 2011 had raised £500,000 to invest in the future of Wrexham AFC. In 2011 Wrexham was put up for sale and WST successfully took ownership of the club – including a £750,000 debt – promising to create a genuinely inclusive community football club. With crowds of around 5000 fans – the highest in many seasons – WST have complete ownership of Wrexham AFC with all funds raised directly for their club. When it comes to periods of turmoil Wrexham fans have been through the mill – something no doubt us Poolies will be able to relate to. Having suffered rogue owners making claims about ownership status while actively trying to sell the club’s ground from beneath the club, then battled through the courts and suffering administration, before finally succumbing to relegation from the football league, it could have been easy to simply give up, however, to the credit of Wrexham fans, the opposite occurred. The WST used those experiences to galvanise their support and their foresight and determination eventually led to their ownership of the club. So, what can we take away for HUST? Well, right now, the Wrexham Trust are in a very different position to HUST as they are full owners of their club. However, there are certainly similarities that can be drawn from the long and proud history of the two clubs. WST demonstrate, as other clubs have also shown, how powerful a voice fans can have when they work together in a structured and democratic organisation. For WST and Brighton this involved legal battles over the club’s stadiums, for Blackpool this was as a protest movement against their owners, for Wrexham, Pompey, Wycombe Wanderers and Exeter City (amongst others) this is as owners of their club. And on a smaller scale – and of most relevance and importance to HUST – other Trusts including Fulham, Norwich, Nottingham Forest, Rochdale, and Grimsby have all delivered formal and meaningful engagement with their club’s management in the form of memorandums of understanding. And as has been reported by many sources engaged fans are more supportive and spend more money! Clearly WST are dedicated to their club and actively sought involvement and engagement with previous owners. They also realised that it was impossible to know what the future would bring and continued to maintain their Trust’s profile and to raise funds for investment in the future security of the club, even when off the field management and ownership had improved. They didn’t know exactly how the funds would be used, and as Peter says in his interview, a community share issue to join with the then owners was considered but not progressed, but they appreciated that with (significant) funds available it gave them options. On behalf of all HUST members can we take the opportunity to thank Peter Jones and his WST colleagues for their time and input for helping us to improve HUST and wish all at Wrexham the very best for the future. You can find out more about Wrexham Supporters Trust here.